Angela Pimentel comes from a working-class family of immigrants. She is a traditional first-generation college student, the first in her family to attend a university. Her mother never made it past elementary school. Despite a family that did not understand the pressures and expectations Pimentel faced in college, she said it was her family’s support of her pursuit of education that inspired her to do well in school. She was named valedictorian of her high school class, maintained As throughout her time at Stan State is graduating with a double major and a near-perfect GPA. 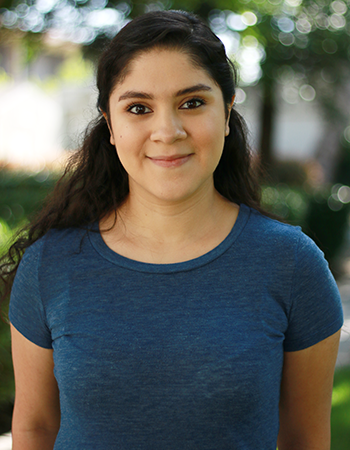 In 2014, when Pimentel first came to Stan State, she struggled. She joined the Educational Opportunity Program on campus and that helped her through. Then, Pimentel decided to become a peer mentor in the Academic Success Center, passing on her knowledge to incoming first-generation freshman from low-income backgrounds in the same program. “My experience as a mentor has taught me that it is always important to give back to a community that has helped you achieve your dreams,” she said. Erlynn S. Johnson, Pimentel’s supervisor in EOP, praised Pimentel’s dedication to the program. After earning dual bachelor’s degrees in political science and history, Pimentel is unsure of her next step; she is weighing options between several graduate programs and law schools. One thing, however, is certain: Pimentel wants to use her knowledge to make a difference in her own backyard. “I very much want to have the capacity to one day give back to the community,” she said.